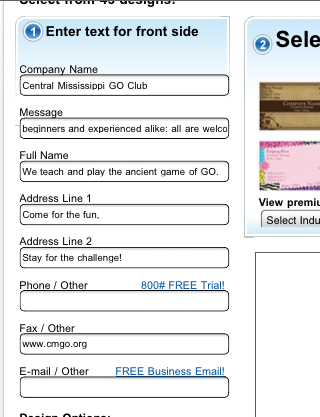 Business Cards for your Go Club are a good way to hand out as reminders of your existence and pointer to your website. I recommend making the cards as generic as possible so you don't have to reprint ($$) with every change. A simple universal advertisement for your club. One place to get inexpensive business cards is VistaPrint, "Free" where you have to pay shipping, about $6 for 250. Occasionally they run other offers of 500 Premium cards for $10 and free shipping. 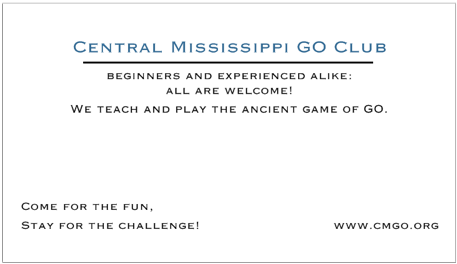 The normally "Free" cards are limited in their design and have "VistaPrint" printed on the back. I like this design because it allows me some free space where I can write more information (my phone, email, meeting times). Here's what I entered on the VistaPrint form to get this arrangement.